The classic EA based on volatility breakout. The system trades by placing pending orders on the most recent support\resistance levels on daily timeframe. For best result, I recommend broker on EET timezone. The broker on EET gives five complete daily candles in a trading week. Timeframe – M30. Currency: GOLD(XAUUSD). The EA can be backtested by bars or every tick. Lots – trading lot size. UseMM_Balance – value in deposit currency. If this value is set (i.e. different from 0), then the trading lot is calculated per each part UseMM_Balance of deposit. If set to 0, then the trading lot size is fixed and =Lots. For example, if Lots=0.1 and UseMM_Balance=300, when the deposit is 300, the EA will open an order of 0.1 lot, and when the deposit is 600 – 0.2 lot, when the deposit is 900 – 0.3 lot, etc. This parameter is needed for reinvestment. EET_offset – EET offset setting. For brokers on EET(GMT+2winter\GMT+3summer) timezone that display five complete daily candles in a trading week (Monday.....Friday) set this value to 0. For other brokers you must set EET offset (-23....23). For example, for broker on CET(GMT+1winter\GMT+2summer) timezone EET_offset=-1. 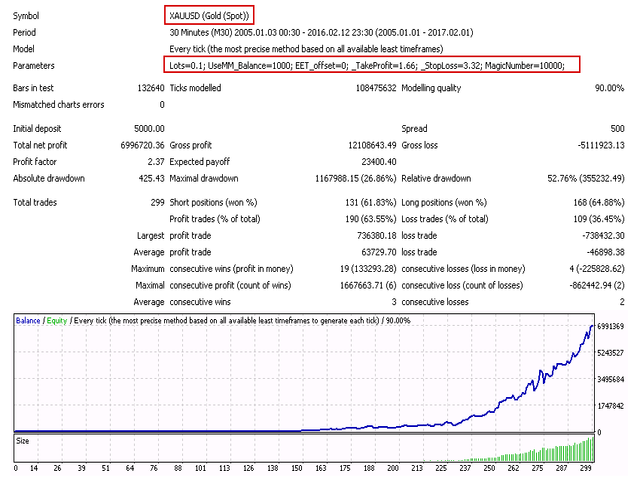 TakeProfit%ofPrice – profit target in percentage of the entry price. StopLoss%ofPrice – max stop-loss in percentage of the entry price. MagicNumber – unique ID for EA's orders. Very nice result and conservative strategy, I love it! So far nice result on my demo accounts. Maybe for me it's the first EA of GOLD on M30.